To begin with, I think I was about several weeks late in reading the book. I read the four books of Monster High prior to The House of Hades and find them interesting too. If you've been a follower of the Heroes of Olympus series, you will remember that the last book- Mark of Athena, didn't end well. 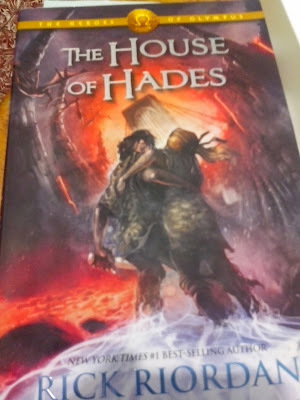 Two of our beloved heroes falls into Tartarus so it was really kind of a suspense until the next book installment which came out after a year. These time, the focus of attention is not on Percy Jackson and Annabeth Chase anymore but on the other characters as well. I like how the kids learn to trust themselves and make use of their talents without any help and of their loyalty to one another. Friendship and being a part of a team are some of the values found in this book. Of course, there's always the lesson in Greek and Roman Mythology. Some scenes about sacrifices and unconditional love between friends also made me tearful. Yes, tears comes easily to me when I read or watch movies. And I'm really happy that my daughter enjoys reading and is collecting the series. Can't wait for the next installment which will be released late 2014- The Blood of Olympus.